Casey Vandervalk admitted that he didn’t know anything about growing Christmas trees when he and his wife Sue planted their first trees in 1984. 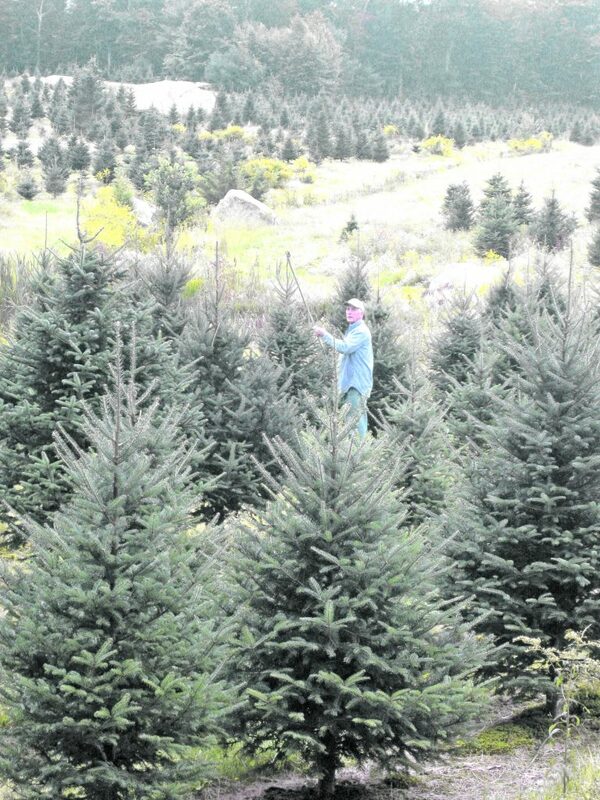 “I planted Norway spruce,” said Casey, adding that he purchased young trees from a nursery in Maine. “We didn’t really know what we were doing.” Casey said the Norway spruce grew well, and the first trees were offered for sale in 1994. After learning more about growing Christmas trees, Casey switched to balsam and Fraser fir, which are the two species currently grown on Vandervalk Farm and Winery in Mendon, MA. Since the farm is situated on a rocky ledge, growing space is limited. New trees are planted within the rows next to old stumps. Casey uses an auger to drill holes for young trees, which are fertilized along with the rest of the trees in the row. The area between rows is managed with mowing, and in-row vegetation is controlled with glyphosate. Trees are basal-pruned about every four years. Casey said when he was getting into the Christmas tree business, the emphasis was “take care of customers and give them things so they continue to come back.” “That isn’t what I’m doing,” he said. “All I do is greet the customers personally – I talk to almost every person who comes in, show them where the saw rack is and send them on their way.” When Casey is busy elsewhere on the farm, he makes sure other greeters are ready to welcome customers. All trees are sold for the same price, no matter what size. “Nothing is tagged, so they can do whatever they want out in the field,” said Casey. “They try to get a bigger tree because they get more for their money. That means my largest trees are all sold and I don’t have to shear them when they get tall.” Casey says most people are looking for a seven- or eight-foot tree, and many repeat customers who previously selected a large, tall tree tell him their tree was too big and they had to cut it to size. In addition to Christmas trees, the Vandervalks grow blueberries. “Another Christmas tree grower was growing blueberries,” said Casey, adding that that grower made blueberry wine. “We had a spot near the barn that would be suitable for blueberries. We have 750 bushes, all fenced and netted to keep the birds out.” The Vandervalks initially sold blueberries at farmers markets, but found that if they took 100 pounds of blueberries to market on a rainy day, that’s what they’d come home with. While Casey had no experience making wine, a friend taught him the process and now Sue handles that aspect. “We gave it to friends and they loved it,” he said. “We’ve been making blueberry wine for five years. It isn’t a big production, and most is sold at Christmas time.” Casey explained that Massachusetts law permits selling wine by the bottle, tastings of an ounce or two, selling to liquor stores within the state and at farmers markets. In keeping with their low-input business model, the Vandervalks rely on solar power for electrical needs. The system was installed seven years ago with help from grants. A solar water heating system was installed in 1979 when their house was built, and wood cut on the farm is used to heat their home. Visit Vandervalk Farm and Winery online at www.VandervalkFarm.com.